Steamboat Springs moguls skier Jaelin Kauf skis last spring in the U.S. National Championships in Steamboat. 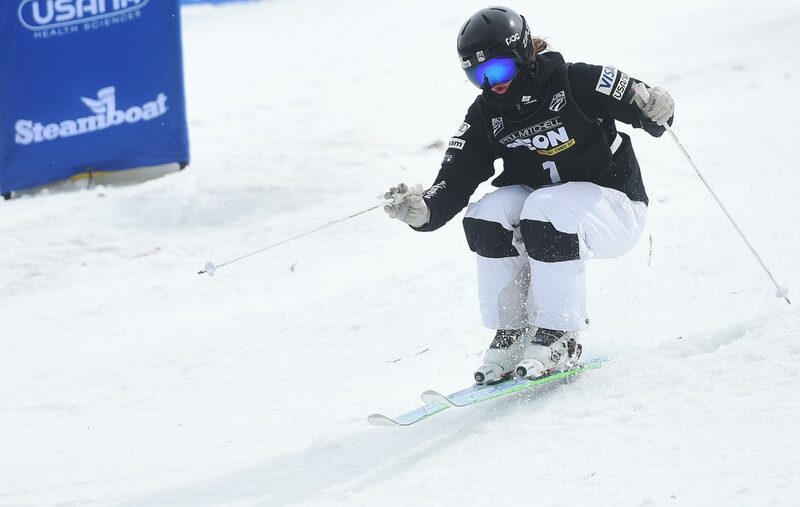 STEAMBOAT SPRINGS — Jaelin Kauf was second on the podium and that was enough to put her back on top for the season. The Steamboat Springs moguls skier added another big line to her resume on Wednesday skiing at a World Cup event at Deer Valley Resort in Park City, Utah, overcoming a so-so run early in the day to land on the podium for the third time in this season’s five events. Strong results from December had already locked Kauf in for the 2018 Winter Olympics, which begin next month in PyeongChang, South Korea. She won one World Cup and was second in another last month after placing fifth in the season’s first World Cup. She flubbed the bottom air in the finals of a World Cup in Calgary, Alberta last week, ultimately placing 16th, but was back in top form Wednesday, at least when it counted the most. Kauf was the last skier to make the cut for the 16-competitor final round. There, she skied fast and well enough to make the six-skier superfinal. Finally, she put down her best run of the night in that group of six. She had a blistering fast time down the course, the second fastest of the night among the women and the best in the superfinal. She was clean on her jumps, as well, and tight on her turns. Only France’s Perrine Laffont was better on the night, scoring in at 81.88 to win the fourth World Cup of her career and the first of her season. Kauf was in with a score of 79.57, just ahead of teammate Morgan Schild, who had the best result of her season with a third-place finish. Kauf’s top competition so far in the season-long World Cup points standings, Australia’s Britteny Cox, barely missed the superfinal and finished seventh. The point difference between second and seventh was enough to catapult Kauf back into the overall World Cup lead with 320 points. Cox is second at 292 and Laffont third at 289. Kauf’s currently the only United States womens moguls skier with a guaranteed spot at the Olympics, though Schild’s performance was a major boost to her chances. One of the top U.S. women entering the season, she started relatively slow, missing the superfinals in the first three World Cups. She’s made each of the last two, however, and climbed the points list to rank as the United States’ No. 2 woman, only behind Kauf. Keaton McCargo also made the superfinal Wednesday and finished fourth. She’s currently sitting in third place among the Americans while Vail’s Tess Johnson is fourth and Steamboat-trained skier Olivia Giaccio fifth. At least three U.S. women will compete at the Olympics and maybe four. Skiers will have two more chances to better their points, starting Thursday – with another World Cup event in Park City. They’ll then compete one final time Jan. 20 in Canada. Just 51 points separate Schild in second and Giaccio in fifth, so every result will be crucial to making the team. Also competing Wednesday was Avital Shimko, a Steamboat Springs athlete competing in her first World Cup after having earned the Park City starts with a stellar performance at last month’s U.S. Team Selections event in Winter Park.